Accelerate Your Mac has posted some user feedback from owners of Pismo PowerBooks with G4/500 and G3/900 processor upgrades, including from folks who have installed Panther. You're always more likely to hear about problems than from those with none (that's human nature) and web sites generally cover problems trying to find a solution and/or determine if the problems are common to a specific model/configuration or not. After a few Pismo owner reports on 10.3 problems previously (some noting the failure to eject the 1st CD for instance - this may be a suspect CD set, although I wonder if it might be an issue only with some OEM optical drives in the Pismo), I thought I'd post some reports from Pismo (PB G3 FireWire/2000) owners that are running 10.3 OK, even with a G4/500 and/or G3/900 CPU upgrade. (There may be other mails on this in my inbox though, these 3 are just ones I ran across that mentioned Pismos and CPU upgrades). Why did you get a PowerBook anyway? Cut that cable and be free! The RoamAbout Wireless Card offers full 10Base-T networking capabilities, full compatibility with AirPort base stations and the entire 802.11b network system! 11 Mbps transfer rate - cruise the Web wirelessly as fast as your cable or phone line can connect. Fully compatible with AirPort software and firmware. Apple, Windows, XP, and Linux drivers included. Note that AirPort software requires OS 9.0.4 or higher (this is standard no matter which cards you use). Certain machines may require upgrades or software to be compatible with AirPort, but this card will work in any AirPort compatible PowerBook that has a PC card slot. ThermographX monitors the various temperature sensors inside your modern Macintosh G4 or G5. Note: Motorola's MPC7450CE/D Rev 5 errata indicates: "The thermal assist unit (TAU) is no longer supported on the MPC7450, MPC7451, or MPC7441." Because of this you will not be able to measure the junction temperature on any system with these processors. 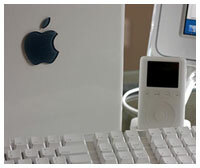 This includes the "Gigabit" PowerBook G4 and the "2001 Quicksilver" Power Mac G4s. Fix bug storing data that would cause data to be presented incorrectly. Fixed restoring of short-term sensor list. Added identification of iBook G4. We, the undersigned, demand that Apple Computers immediately acknowledge and address the manufacturing defect on the LCD screens of its PowerBook G4 laptops. The LCD screens of these laptops are susceptible to random "White Spots" appearing on the display. These spots are very distracting and are an obvious manufacturing defect. PowerBook owners around the world have been complaining of this problem. Evidence of this can be seen on Apple's own discussion group website located at http://discussions.info.apple.com and on various message board discussion groups on the Internet. Due to the extremely large number of PowerBook owners that have been sending their newly purchased laptops for repair under warranty, it is OBVIOUS that Apple is aware of this defect. However, most customers have been noticing this problem reoccur within hours or days of their PowerBook being repaired under warranty. This is completely unacceptable. Apple must immediately acknowledge that it is aware of this manufacturing defect. Customers should be given the option to return the product for a complete refund even after the usual 10 day refund policy. A 10 day refund policy should not apply to customers who have been sold a product that is known to be susceptible to manufacturing defects. If the customer opts for a repair, then Apple must ensure that the LCD screen is replaced with one that does not seem susceptible to this problem. The Saga 14" iBook Handbag safely and efficiently carries your iBook while also doubling as a stylish and sophisticated business case. The handbag is lightweight but offers a range of pockets for business items, computer accessories, personal items, change, and other articles. Fits, without creating unsightly bulges, the iBook, the iBook AV cable, extra battery, power adapter and grounded cord, a Podium Pad, iPod, iPod dock and connecting cord, iPod wall and auto car power adapters, iPod car FM transmitter, cell phone, and other personal items. Shoulder strap is 34" (86 cm) long so is suitable for larger framed persons or for those taller than 5' 4" (161 cm). Elegant, clean and very stylish handbag style exterior. Light weight (2.25 lb.) for maximum carrying comfort. Accentuated security for your laptop by a handbag style which doesn't advertise it's holding a laptop. Excellent protection for your iBook afforded by a specially designed sleeve with 0.6 cm (0.3") soft "gushy" foam reinforced by high density polystyrene reinforcement on all sides. Separate shoulder strap for iBook sleeve times when you want to carry only the iBook. Extra carrying comfort for extra long or heavy loads is provided by an extra wide foam padded shoulder cushion which can be secured to the shoulder strap top, integrated organizer panel with pockets for business cards, pens, pencils, cellphone, iPod, notepad etc. Convenient zippered accessory or make-up pocket, smaller accessory item and change pockets on side. Two separate, removable key chain clips for home and office, or house and car key separations. The Legend 15" PowerBook Handbag offers a dual role of a stylish handbag, a personal organizer bag and a highly protective 15" PowerBook carry bag. The handbag is lightweight but offers a range of pockets for business items, computer accessories, personal items, change and other stuff. Fits, without creating unsightly bulges, the 15" PowerBook, PowerBook AV cable, extra battery, power adapter and grounded cord, a Podium Pad, iPod, iPod dock and connecting cord, iPod wall and auto car power adapters, iPod car FM transmitter, cell phone, and personal items. Excellent protection for your PowerBook afforded by a specially designed sleeve with 0.6 cm (0.3") soft "gushy" foam reinforced by high density polystyrene reinforcement on all sides. Separate shoulder strap for PowerBook sleeve times when you want to carry only the iBook. integrated organizer panel with pockets for business cards, pens, pencils, cellphone, iPod, notepad etc. Not a Mac portable item, but PowerLogix has announced the PowerCube, an aluminum alloy enclosure for the PowerMac G4 Cube. The PowerCube offers both up-to-date styling and functional improvements over the original acrylic Cube enclosure. Cube owners can now realize significantly enhanced CPU and graphics performance without the risk of additional heat. Manufactured in the USA, the PowerCube is precision machined using 5052 aluminum alloy, then hand-assembled. Three finishes are available: "G5-style" anodized aluminum, glossy black powder coat, or cool white powder coat. Two optional perforated cooling grilles are offered; anodized aluminum or mirror chrome. The all-metal PowerCube offers superior cooling over the original Cube. With the PowerCube, the system can be safely upgraded with a faster processor and a high-performance video card. For virtually silent operation, the PowerCube retains the "fan less" design of the original cube. Cubeowner.com, the preeminent online community for the PowerMac Cube, commented: "PowerLogix has graced us with a unique, functional, yet still-stylish spin on our beloved Cube and should be applauded for their efforts. The potential performance gains and customization options of the outer shell make the PowerCube a welcome update to a timeless classic." The system is compatible with all versions of the original PowerMac Cube. The PowerCube is available direct from PowerLogix and is shipping now. Lexar Media, Inc. has introduced JumpDrive Music, a portable USB flash storage device that enables people to easily store, carry, and transfer data files, while also serving as a full-featured MP3 player. JumpDrive Music, Lexar Media's first JumpDrive with MP3 player capability, furthers the company's well-established position as a leader in the USB flashdrive media category by delivering reliable storage capacity for mobile computer users, while satisfying the growing number of consumers seeking a portable digital music solution. "JumpDrive Music is a natural extension of our popular JumpDrive USB flashdrive products," said Dave Klenske, director of product marketing, Lexar Media. "Since entering this category Lexar Media has satisfied different audiences with highly sought after features including high-speed capability and security software. JumpDrive Music will appeal to active people who desire storage capacity for all of their valuable information including music." JumpDrive Music will be available in 128 MB and 256 MB capacities and can store approximately two to four hours of high quality music, or the data equivalent of 88 or 176 floppy disks, respectively. Affordably priced at $89.99 and $159.99, JumpDrive Music is ideal for students and mobile professionals who have the need to transport valuable document files but also enjoy traveling with their favorite music. The USB connection and compact size allow users to quickly download personalized music selections to enjoy throughout the day. JumpDrive Music includes a host of MP3 player features to enhance the user's experience, including an easy-to-use single navigation button for accessing all player controls, an equalizer, and an easy to read backlit LCD display. JumpDrive supports MP3 and WMA, the most popular digital audio formats on the market today. JumpDrive Music will be available at retail locations nationwide in November 2003 and includes one AAA battery, earbud headphones, a lanyard, and a USB cable for quick and easy connection to a PC or Macintosh. JumpDrive Music is compatible with Windows 2000/Me/XP, Mac OS X, and Mac OS 9 operating systems with no drivers required. Packard Bell is set to become the first major notebook vendor to offer a portable PC based on AMD's Athlon 64 chip. According the company's German web site, the EasyNote M3308 will contain an Athlon 64 3000+, along with 512 MB of DDR SDRAM, a 60 GB hard drive and a DVD-RW optical unit. The machine's 15.4" 1280 x 800 screen is powered by an ATI Mobility Radeon 9000 chip with 64 MB of dedicated graphics memory. Previous generation iBook G3 (Dual boot, OS X/OS 9 configurations). These iBook products are new and unopened units.